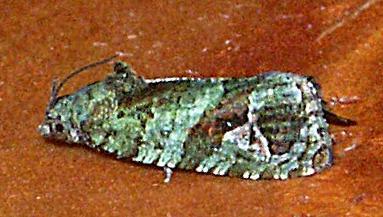 The adult moth of this species has forewings that each have a complex greenish brown pattern, including a large irregular dark spot near the margin, and a dark band across the middle. The green hue appears to fade in older specimens. The hindwings are plain brown. CSIRO Publishing, 2006, pp. 93-98. LeapFrogOz, Kuranda, 2015, p. 212.